Rochedale is an outer southern suburb of the City of Brisbane, Queensland, Australia. It is 17 kilometres (11 mi) south-east of the Brisbane central business district. At the 2016 Australian Census the suburb recorded a population of 3,175. The suburb’s western boundary is partially aligned with the Gateway Motorway and Bulimba Creek. During convict settlement, explorers passed through the region but it was not until 1865 that the first settlers started farming the area’s rich alluvial soil. The area takes its name from the Roche family, who emigrated from Ireland to Australia in 1860 and settled in the region. The family built a homestead they called Rochedale in 1868. During the 1960s residential development took off in the area. One local builder, Jack Davey was responsible for some of the new estates off Rochedale Road between Underwood Road and Priestdale Road. Some of the street names are family names such as Rhonda Street and Davey Street. The family lived in the area until the mid 1990s. The suburb of Rochedale is supported by many community organisations including sporting clubs, religious entities, youth organisations and educational groups. In 1956, the was formed and established a Scout Den on the corner of Grieve and Rochedale Roads. This parcel of land was zoned for recreational use by the Queensland Government. In 1981, the Redeemer Lutheran College was established. The Rochedale dump began operations in 1991. A waste-to-energy facility has been generating electricity since 2004. The Pacific Motorway passes through western parts of the suburb. 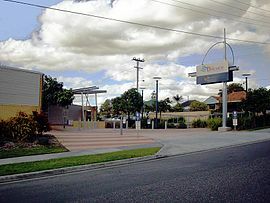 The Mt Gravatt Bus Service provides public transport services in Rochedale to surrounding areas. ^ a b Australian Bureau of Statistics (27 June 2017). “Rochedale (State Suburb)”. 2016 Census QuickStats. Retrieved 14 January 2018. ^ “Chandler Ward”. Brisbane City Council. Brisbane City Council. Retrieved 12 March 2017. ^ “Rochedale – 10 May 2014 (entry 41661)”. Queensland Place Names. Queensland Government. ^ “Ourbrisbane: Rochedale”. Suburb Profiles. Brisbane City Council. 12 February 2008. Archived from the original on 14 January 2004. Retrieved 22 December 2013. via the Wayback Machine. ^ a b “Rochedale South”. Logan City Council. 1 May 2013. Retrieved 28 December 2013. ^ AAP (15 May 2011). “Brisbane turns garbage to power with waste-to-energy generation plant from Landfill Gas Industries”. thecouriermail.com.au. News Ltd. Retrieved 27 December 2013. ^ a b Australian Bureau of Statistics (31 October 2012). “Rochedale (State Suburb)”. 2011 Census QuickStats. Retrieved 27 December 2013. “Rochedale”. BRISbites. Brisbane City Council. Archived from the original on 23 July 2008. “Rochedale”. Our Brisbane. Brisbane City Council. Archived from the original on 14 January 2004.